On July 9, Courtney Best, 26, stepped outside of the Papa Murphy’s pizza in Corpus Christi, Tx. where she works, for a quick cigarette. Instead of going out back—her normal routine–for a smoke, on this day, she stepped out front and the move may have saved child’s life. The Amber Alert was for 7-year-old Nicolas Gomez who had been abducted from Alice, Tx. Best told the news station that she saw the man who was with a child but still wasn’t convinced that the person was suspect. “The man was walking across the parking lot looking at me … ’cause I was the only person out here, with the little boy, and the little boy looked scared, and I was like, ‘no, that’s not him,'” she said. 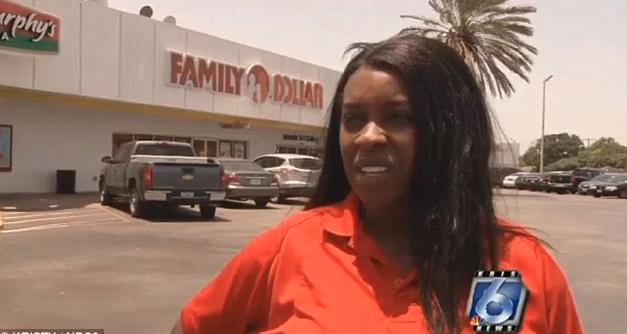 Best told the news station that she waited for the man and the boy to walk into a Dollar Store before she ran to check the license plate against the Amber Alert. The plates matched the alert. Best immediately called the police and gave them the suspect’s location, he was arrested and Nicolas was returned home. Best sheepishly admitted that she normally doesn’t pay close attention to Amber Alerts when they come across her phone but she vowed that she would pay super close attention now. Wow! That was perfect timing! God is good! Whew, good for this young lady. Wow, she acted very prudently; making good choices that wouldn’t make the suspect realize what she was up to. I’m sure that there is one mother out there that is glad Ms. Best went to smoke. Definitely! Couldn’t have said it better myself. so good to know people are watching….